Searching for a basic nylon dog leash in a classic style? Look no further than our Zack & Zoey Nylon Dog Leash in Jet Black! 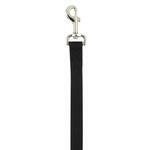 Add some durability and classic style to your walks with our Zack & Zoey Jet Black Nylon Leash. 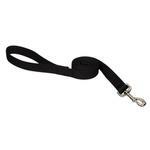 This black nylon leash will be a staple for any dog or cat's walking wardrobe. Each leash features a nickel-plated swivel clip for a quick and secure attachment. The black color will go with anything and is a great choice any event. This durable nylon leash has reinforced stitching to give you and your pet many years of walking enjoyment. You will love the classic design of this nylon dog leash in Jet Black. Available in multiple colors. Matching couplers, collars, and dog harnesses are available too. Choose the 5/8" width for smaller breeds, and the 1" width for medium to large breeds. Zack and Zoey Nylon Dog Leash - Jet Black Customer Photos - Send us your photo! Mia loves walking to the local park on her Zack and Zoey Nylon Dog Leash! Sasha is enjoying her first day at the James River. She is still a little scared so she's decided to stay on the rock after dipping into the water to cool off on this hot day! I'm not speaking to my Dad 'cuz he told me I had to get out of the water. Good thing I was on a leash because we found out I can't swim... at all. (I can make really cool bubbles under water though) Next purchase? Life vest! Love, love, love to go camping and fishing, and swimming (Duke's version of swimming is really just walking around in neck deep water). It's great to have inexpensive collars and leashes that sometimes usually get filthy. Dolly and Furry Friends in Central Park ! Posted On 08/09/17 by Carrie S from Loganville, GA Yes, Carrie S recommends this product! If you want your dog right next to you while you walk or train this is a great length. Black goes with every outfit, too. Posted On 05/01/17 by Allison P from Tulsa, OK Yes, Allison P recommends this product! They are great! Exactly as I expected they would be, very fast shipping and good quality. Posted On 04/22/17 by Stacey U from , Yes, Stacey U recommends this product! Well made leash. Fast and great service. Abundant items to choose from. Posted On 03/08/17 by Kasey N from , NY Yes, Kasey N recommends this product! Posted On 02/01/16 by Nancy T from DAYTON, OH Yes, Nancy T recommends this product! This is a very well made item and the color is rich . It matches her black non-choking harness I recently purchased along with a fleece pop over . This makes a pretty and fashionable ensemble for winter walks !! Posted On 12/07/15 by Becky B from , Yes, Becky B recommends this product! Great leash! Perfect size. I've had a hard time finding this width--most leashes seem to be either 3/8" or 1" and I like this almost 3/4" size for my dogs. These seem to be sturdy without being too heavy and stiff. My only complaint was the little hook-thing it came on. I couldn't get it off with scissors, wire-cutters, pruners, a knife, or a hammer. I finally pried it open with a screwdriver after I'd basically destroyed it already. I don't know why it comes like that in the mail! It's not going to be shoplifted or anything! Posted On 08/31/15 by June K from Mount Prospect, IL Yes, June K recommends this product! Great buy for the price. The leash is very sturdy! Posted On 07/28/15 by Reggie J from Denver, CO Yes, Reggie J recommends this product! This is a pretty good leash, especially for the price. I wish it was a little thicker but it does a great job and hasn't fallen apart, even after my pup has chewed on it a bit. If she gets through it, will be coming back for another one. Posted On 07/11/15 by Cheryl S from , GA Yes, Cheryl S recommends this product! Very well made, sturdy, should last a long time. Great price! Posted On 07/09/15 by Bowie from Los Angeles, CA Yes, Bowie recommends this product! Posted On 05/12/15 by Deborah H from Houston, TX Yes, Deborah H recommends this product! Perfect no frills leash - not fancy, but effective. Posted On 12/09/14 by Diane H from , CA Yes, Diane H recommends this product! I love this leash. It is the perfect length for walking my dog. I prefer the shorter length so that I can keep my dog closer to me when we are out in public. Get construction & it feels nice in your hand. Posted On 12/09/14 by Mary C from New York, NY Yes, Mary C recommends this product! Allow shop-safe card numbers to be used.